Trends and labels are a bold intrinsic link between the rapidly moving realms of fashion and identity. One could argue that these two topics are, in fact, part of one other’s core framework and cannot stand without input from the other. Fashion is dictated by lots of things, perhaps first and foremost through the creative splurges and regurgitations from the mind of a haute couture designer, from their brain out into their hands, to create new and ‘fashionable’ creations. But this designer must’ve had their muse; their character and epitome of the image they’re trying to portray. They must’ve aimed to created some sort of identity through their fashions. Because everyone wants to be identified and known, right? It would appear so, as I’m walking down my less than fashionable town High Street, Vans, chinos, gilets and tracksuits (although numbers are dwindling), striped socks, Abercrombie and Hollister wannabes and the new craze that’s apparently fashionable- fluffy hats with animal faces on and dangly bits down the side. I am not amused. Let me pick on one collective group of people. I am stereotyping, but the sad thing is, the kids who fit into this category simply play into the role of preppy, ‘vintage’, Americana, Topshop-inspired look ‘indie kids’. Let me paint a picture of a majority of young people stepping their American brand shoes through the doors of TOPMAN and Topshop and numerous other fashion establishments at the moment. It’s customary for both girls and boys to wear Americana brand shoes. For example, Vans or Converse will do perfectly, often in navy, burgundy or white. Working our way up, chinos are the choice of the day (or year) and these often arrive in a shade of mustard or camel. For girls, it’s much more ‘indie’ (or, slutty…) with denim high-waisted shorts, often with an American flag on, that cut half way up the arse cheek. That is no joke. Often, it’s customary for leggings to be forgotten, even in winter weather, and replaced with tights. Yes, I can see through them, and yes, I can see the Primark underwear underneath- it is not nice. Either that, or bold print leggings, with a new symbol every season. The peace symbol really got an outing this summer. Following this, a choice selection of denim shirts, Christmas and grandad jumper on top, with studs just about everywhere, perhaps song long socks, with some tell-tale TOPMAN Disney jumpers or something as ghastly. Girls and boys share tops, as it’s cool to wear boys clothes, right? Now, this rant is not at the naive and feeble children who choose to copy millions of others nationwide in this trending bonanza, but the label they happily hand themselves, on a luggage label, proudly presented around their neck, like an evacuated child in WW2. It seems cool to be one of millions; literally a sheep in ‘hip’ and ‘indie’ clothing. Not too long ago, these labels were the bane of school life, and fought off by proudly individual kids. If you looked different, you were weird. Then it was good to be different. And now the whole idea is spiralling out of control, with indie kids ruling the shopping centres ‘these Vans were meant for walking’ style, but forgetting one vital thing. 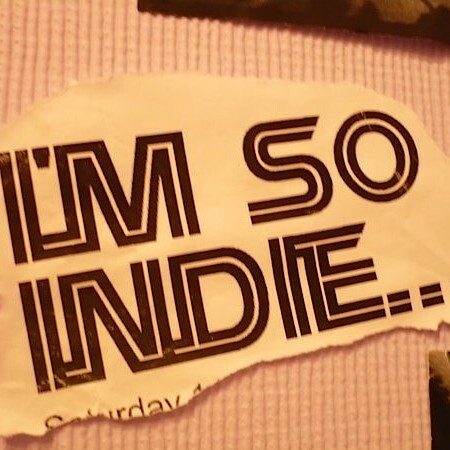 Indie is an abbreviation of individual. And by no means, and no stretch of the imagination, are these kids and their fashions individual.